The Columbia River CRKT 2832 Mossback Bird and Trout is a slim, fixed blade hunting knife that works equally well on fish and game. Its modified drop point blade has a sharp, narrow point that pierces with ease, as well as a long plain edge cutting belly for slicing, and comes with a wear-resistant powder finish. The G10 handle provides a secure, comfortable grip that won't slip in your hand as you work, and features a large lanyard hole for improved retention. 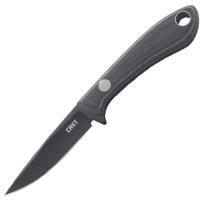 The knife comes with its own nylon web sheath with a belt loop for convenient carry.